Chinese and Japanese chemists have highlighted hot water’s ability to promote unexpected reactions without any other reagents or catalysts. The work should expand our understanding of how to harness the physicochemical properties of water to potentially replace more complex reagents and catalysts. Above its critical point at 374°C and 218atm the properties of water change quite dramatically, explains Hiizu Iwamura from Nihon University in Tokyo. But even below that point, as water is heated, hydrogen bonding and hydrophobic interactions are disrupted. ‘This means that organic compounds get more soluble and salts become insoluble in hot pressurised water,’ Iwamura says. Dissociation of water into hydroxide (OH–) and hydronium (H3O+) ions also increases, he adds, so there are higher concentrations of these ions available to act as catalysts for reactions. Iwamura was synthesising triaroylbenzene molecules for a previous project on molecular magnets, using base-catalysed Michael addition reactions, when he first became interested in whether the reactions might work in water. He teamed up with a chemical engineer colleague, Toshihiko Hiaki, who is more familiar with working at the required temperatures and pressures. Together, they found that 4-methoxy-3-buten-2-one could be transformed into 1,3,5-triacetylbenzene in pressurised water at 150°C, with no other additives . When Qu’s team hydrolysed an epoxide made from (-)-α-pinene, they found that at room temperature they got (-)-sobrerol, the product they expected. But at 60°C or higher, the sobrerol began to racemise, giving a mixture of the (+)- and (-)-forms (see reaction scheme). ‘We couldn’t understand why this was happening at first,’ says Qu, but eventually it became clear that the allylic alcohol group in the sobrerol, which is much less reactive than the epoxide in pinene, was also being hydrolysed. The same reactions happen at room temperature if acid is added, Qu says, but don’t happen in propanol or other alcoholic and hydrogen-bonding solvents heated to the same temperatures, so it is not simply a thermal effect. Qu points out that these observations, along with those of Iwamura’s team, show that molecules that might usually be considered unreactive in water can undergo useful transformations. And these reactions can take place without other reagents or solvents, which would create extra waste streams. Also, owing to the decreased solubility of the organic product molecules when the solutions are cooled back to room temperature, they are often easy to purify as well. 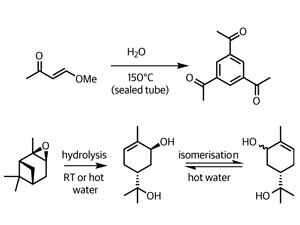 Iwamura suggests that there are many other simple acid- and base-catalysed reactions that might be suitable for reacting in hot water. However, reactions with thermally unstable molecules, or those requiring delicate selectivity, are unlikely to be so effective at higher temperatures, he adds. He also makes a distinction between Qu’s work – in which the water molecules are directly involved in the reaction – and his own group’s, in which the water acts as the reaction medium and provides the catalyst. ‘Our reaction did not take place in water heated at reflux,’ Iwamura adds. However, Hiaki points out that the potential environmental benefits of reduced waste streams will have little impact on industrial chemistry if the reactions remain confined to batch processes. ‘High temperature and pressure is detrimental for the scale up to commercial chemical plants,’ he says. For that reason, the team is developing a flow microreactor system that should be more industry compatible. Original Article from By Phillip Broadwith from Chemistry World.